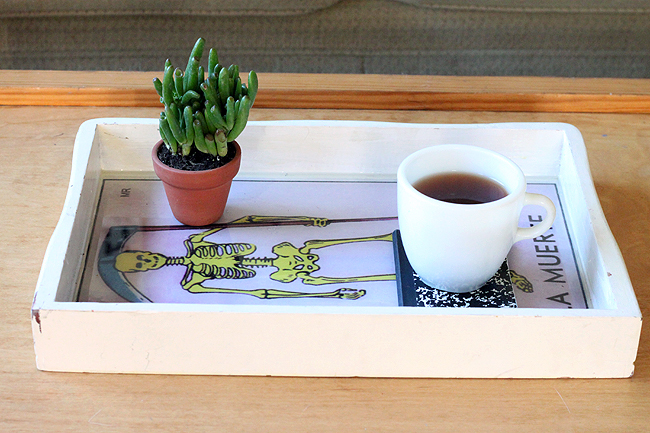 MODify: Thrifted Serving Tray Decoupage Skeleton Transformation. Great Gift! I love how trays help you make an immediate composition in a space, how they help you serve guests in style and how they protect your furniture from moisture. 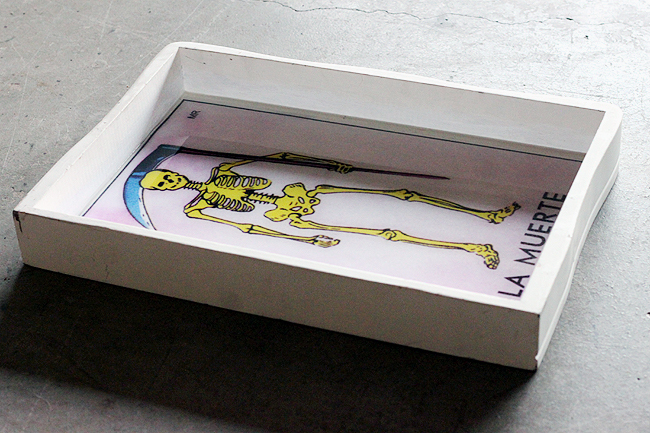 The quirkier the tray, the better. A flea market vendor gave me a plain wooden tray for free as part of a "fill a bag for $5.00" deal and the muse to transform it finally struck. I'm keeping it on my living room coffee table for serving drinks and wrangling extras. This is a great beginner craft for experimenting resin. It's a tricky medium but the deep, shining, professional finish it leaves is worth it! Step 1) Get exact measurements for your tray and enlarge and print the image you want to use for the background yourself OR go to a local print shop with the dimensions and they'll do this for you. I used card stock for this craft and had a local print shop blow the image up for me. It cost $3.10. Step 2) Glue your paper to the base of your tray. Use a glue stick or spray adhesive to control the amount of paint used (unless you want to carefully paint on white glue with a sponge brush). Make sure to press down your image firmly, especially around all of the edges to keep resin from seeping under the paper. Step 3) Follow the directions on your resin to mix it up very precesicely to ensure the proper chemical reaction, then pour the resin inside your tray. From here you can tilt your tray carefully until the level of resin is even. If large bubbles form at the top of the resin layer gently blow on them to pop 'em. The smaller ones should disappear as the resin dries. Step 4) You may want to paint the sides of your trays, I liked the natural white distressed finish I received the tray in so I simply coated it with clear varnish for a shiny, professional finish. Step 5) Set your tray somewhere safe. You want a dry place free of floating dust or hair that could settle into the slow-curing resin. It usually takes 24 full hours before it's fully hard and no longer tacky. Be patient, don't touch it to "test it" until 24 hours pass or you may mess up your finish. Don't set very hot objects on the serving tray. Transform any trays you have around or thrift for new ones, they're ample 2nd hand. I have a plain black one I use to wrangle my smoothie goodies that'll get a makeover next. Make 'em for your friends, coupled with crafted coasters they make a gorgeous and practical Christmas or housewarming gift. I love the depth the shiny resin adds to the tray. You getting any creative crafting on? I think my favorite type of craft is transforming something bland into something beautiful. 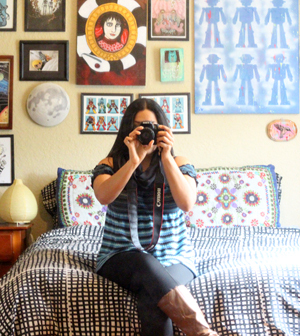 You don't have to spend a cent to get creative. I love this! 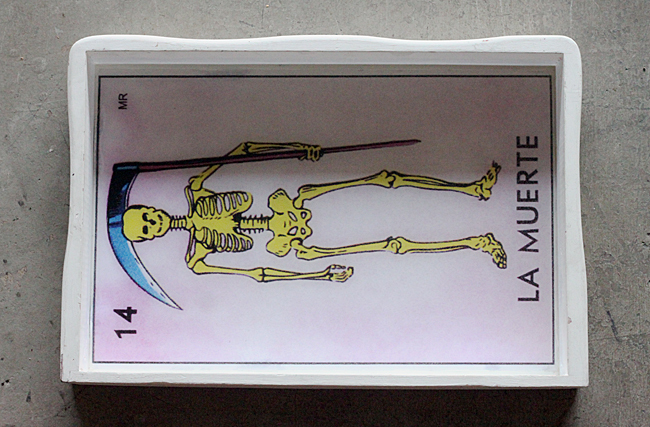 I'm a big fan of Loteria artwork, so this is right up my alley. 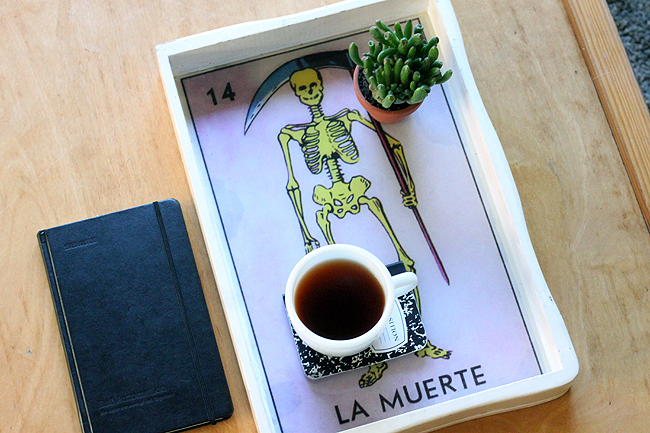 I never would have thought about modifying a serving tray, but it's a really cool way to modernize a vintage idea. You could even repurpose them for storage or display too. Thanks for the idea! Very cool. No prob. Loteria card artwork is AMAZING, I have more ideas to play with that style of illustration. :D And yep, that's what I use trays for more than anything else. Nice job! I was just thinking last week how cool it would be to scan and enlarge some vintage game cards as artwork, but a tray is a good idea! Thanks! I'd love to blow up some vintage cards/book pages for canvas and add paint or object details, then cover in resin next. Omg THIS! Love it! I just scored a Loteria deck and several vintage decks of tarot cards not that long ago. This project needs to happen! I've never worked with resin before. Do you think the same look can be achieved with high gloss spray sealant? I think resin is best for this, it's really going to seal it and it looks a LOT better. If you follow the directions the resin's not too tricky and this being a tray you can tilt around makes it so much easier than canvas or table, which makes a damn mess if it drips off the edges. From past experiences spray on can be good for quick touches to furniture but wasn't good for decoupage projects, the edges of the paper peeled up over time. Worth a try with lots of layers of varnish. 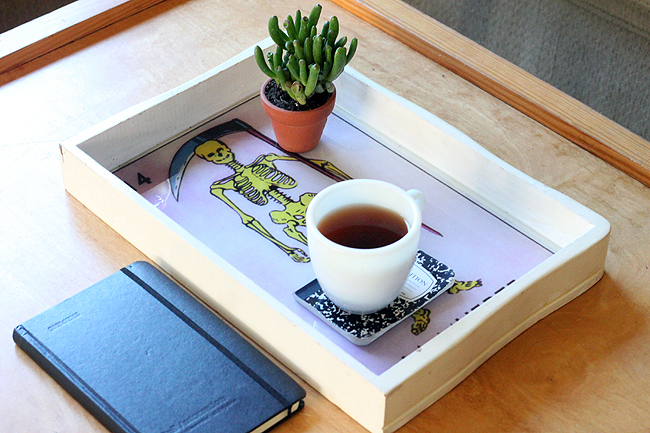 That skeleton tray rocks! I love this idea - well done! Great tutuorial! I have to try this some day! Wow, what a great idea and the tray looks nice! Thanks Teodora. 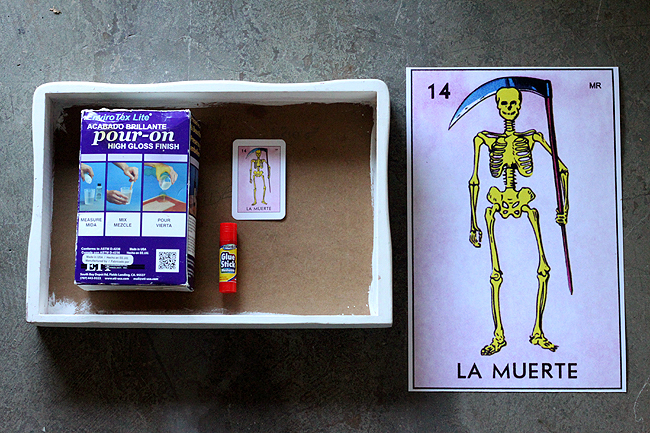 I'm excited to play with resin and Loteria illustrations more.